Moody’s downgraded China’s debt rating from Aa3 (S&P: AA-) to A1 (S&P: A+) in May 2017, given widespread expansion of debt in addition to its expectation of slowing economic growth. Separately, Chinese regulators recently passed a law requiring commercial banks to incorporate proper risk management, governance, and other informational reporting related to loan collateral. These developments—and the growth in off-balance sheet financing in the country—are important indicators that suggest credit risks are expanding in China. Risk in China will have knock-on effects throughout the region. China has also tightened monetary policy, and the country’s yield curve has flattened considerably over the last twelve months. Companies that will be impacted the worst by this are highly leveraged Chinese operators. To help tackle such risks, CreditRiskMonitor provides FRISK® score coverage on thousands of public companies across China and Taiwan. The FRISK® score is a proprietary measure that assesses a company’s risk of financial distress over the coming twelve-month period. The worst possible score is one, and the best score is ten. 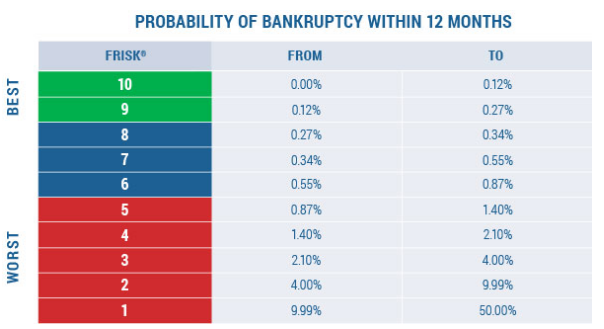 Moreover, a score below six indicates a heightened risk of financial distress, known as the FRISK® red zone. Any company showing in the red zone should be monitored closely. Across China and Taiwan, there are several hundred companies trending in the red zone. Although that’s not an outlandishly large figure, it is big enough to wonder if one of your suppliers or customers falls into this high risk category. A company with a low FRISK® score—in tandem with a tightening Chinese credit market—might stand out as a major counterparty risk. Using each company’s most recent financial data, the average z-score for this group is negative. This low reading indicates that the collective probability of corporate failure for this group is elevated. Meanwhile, the average liability-to-asset ratio approximates 91%, and the median debt-to-equity ratio comes in at 3.1 times. Both figures are indications of high leverage. Lastly, ten out of the twelve have reported negative working capital, with an average quick ratio of just 0.32, which suggests inadequate liquidity. It’s important to examine the financial health of foreign counterparties. What is shown above is just a small sample of the many Chinese operators that have a FRISK® score in the red zone. Companies with excessive debt could face financial trouble sooner rather than later if borrowing costs increase, or, in a worst case scenario, certain names could lose future funding. Counterparty risks like these can have an effect on one’s own company’s profitability. The FRISK® Stress Index is a model that provides the average probability of failure for a group of companies (e.g., by industry, portfolio, or country) over the next twelve months. The level of risk is measured on a scale of zero to fifty, with fifty being the most risky.